This is the first DLC since Bungie and Activision parted ways, and there’s a lot of stuff to be getting on with in Season of the Drifter. In the most recent ViDoc, the team behind Destiny 2 discussed that they were excited to see what a roadmap and content controlled by Bungie would look like. Apparently, it’s very busy and full of new PvE modes, Pinnacle weapons and an armour set that’s got a definite Master Chief vibe. All Destiny 2 players get access to at least some of the content in Season of the Drifter, although Annual Pass holders will get access to everything. 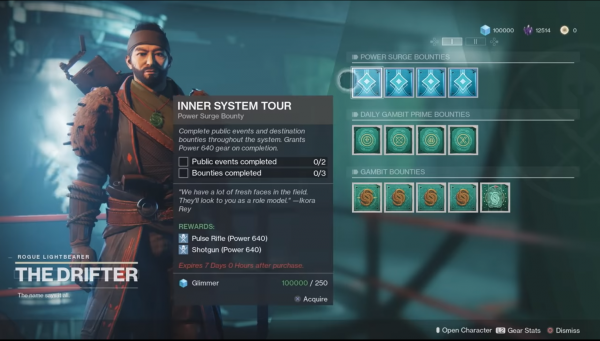 The Drifter will have new Power Surge bounties that Annual Pass holders can pick up that will boost your Power to 640 after an hour or two of gameplay, which makes the climb to 700 a bit easier. The ViDoc also reveals the title of the next season, Season of Opulence, which starts in June. Let’s break down what’s coming to Destiny 2 over the next few weeks. The new season begins on March 5 at the usual reset time of 5 pm GMT/ 12 pm ET/ 9 am PT. There will be some downtime before the update is released. Gambit Prime is the new PvPvE mode coming to Destiny 2. Described as a high risk, high reward mode, you can assume one of four roles and build a new armour set that has its own unique perks. Teamwork is essential in Gambit Prime, though there’s nothing stopping you from having a full team of Invaders if you wish. Each match will last one round and Prime is set to evolve over time. You can drain motes from the enemy side and there will be more of a team-focused approach to taking down Primevals. You’ll also be able to host your own private Gambit matches in Season of the Drifter. You can jump in with a fireteam or solo to have a look at the maps or create your own tournament. From April 2 you’ll also be able to host your own Gambit Prime matches. Gambit is also getting new maps. The first is New Arcadia on Mars which launches with Gambit Prime. The second is Deep Six on Titan which comes on March 12, with Legion’s Folly on Nessus following on March 19. The final map, Emerald Coast on Earth, comes on March 26. Annual Pass holders will also get access to a new activity called The Reckoning. Once you’ve completed your first Gambit Prime match, you’ll be able to access it. The Drifter is in cahoots with the Nine, so be prepared to face hell in The Reckoning. You’ll be in a fireteam of four in a PvE activity that’s similar to the likes of Blind Well. You’ll have enemies rushing at you from all sides so be prepared. There’s also a tonne of lore about The Drifter and the Nine to be found by taking part in The Reckoning. The Reckoning offers up the fancy new armour pieces as your reward, so the general idea is to jump between Gambit Prime and The Reckoning with better perks each time. There will be a timer counting down, so move fast and kill fast. The Reckoning’s first tier will be available on March 5, with the second and third tiers unlocking on March 8 and March 15 respectively. There’s also a few unnamed weapons to be found. From March 15, you’ll have a new questline called Invitations of the Nine. You’ll learn more about the mysterious beings by picking up and completing weekly bounties from Xur. This quest will run for nine weeks, so have a chat with Xur when he reappears to pick up the Invitation which becomes the Into the Unknown bounty. The Allegiance quest is the main story mission which has you choose between the Drifter and the Vanguard. This change the course of your Destiny 2 story permanently, so choose wisely. Details about this quest are scarce, so we’ll update you once we know more. This is one of two new quests that players can complete, the other being the quest to unlock Thorn. It’s not clear if Thorn is going to be just as devastating in Destiny 2 or if it’s been potentially nerfed. Both of these quests will be available from March 12 onwards. We’ve already talked about the three new Pinnacle weapons you get from The Reckoning and Gambit Prime, but there will also be Vanguard, Crucible and Gambit Pinnacle weapons. The Vanguard weapon is the Oxygen SR3 scout rifle. It has the Dragonfly perk where each precision kill causes an explosion. The more headshots you do, the more damage you’ll cause. The Crucible weapon is The Recluse submachine gun. It has the Rampage perk where kills from any weapon increase its damage for a short time. Finally, Gambit’s Pinnacle weapon is the 21% Delirium machine gun. It also has a version of the Rampage perk where its damage increases until you store or reload the weapon. There will be two in-game events in Season of the Drifter, which are Arc Week and The Revelry festival. Arc Week begins April 9 and The Revelry runs from April 16 to May 6. We’re not sure what’s coming with these events, though it would be reasonable to expect that there will be Arc related bounties and challenges to complete. If you’re new to Destiny 2, check out our Destiny 2: Forsaken guide for more tips, hints and walkthroughs.